Climate change is no longer a debate — we need to see serious action from brands that made commitments to stop destroying forests for palm oil. 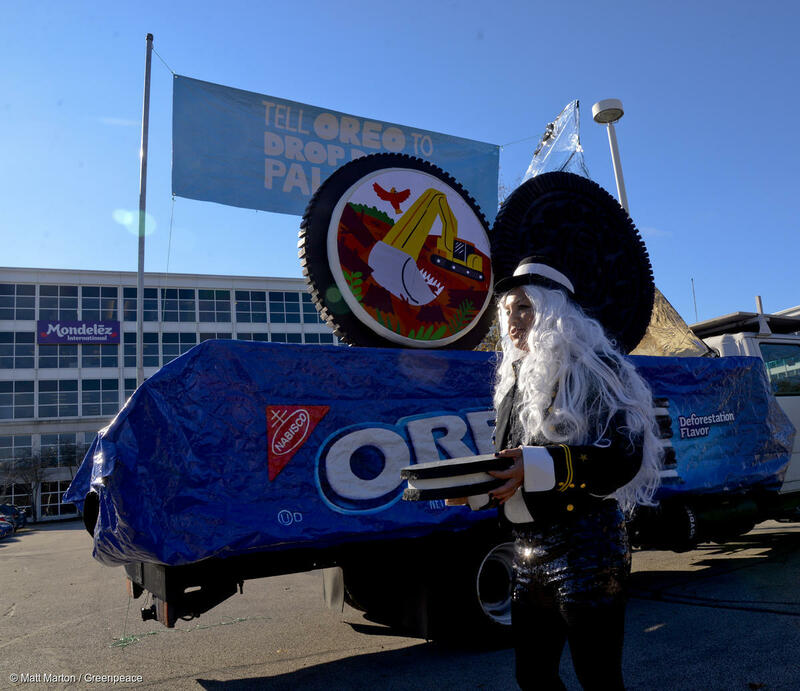 Greenpeace USA activists deliver a gigantic Oreo at the global headquarters of snack food giant Mondelez, makers of Oreo to highlight the connection between the cookie and forest destruction for palm oil. Oreo promises to provide its customers a world of “Wonderfilled” when they take a bite out of an Oreo. What they aren’t saying is that their palm oil suppliers are still thrashing forests and wrecking orangutan habitats. That is why, Greenpeace USA activists went to the global headquarters of Mondelez, makers of Oreo, to unveil a new Oreo ‘deforestation’ flavor — highlighting the brand’s connection between the beloved cookie and forest destruction. Mondelez is a large buyer of palm oil, which is a key ingredient found in the majority of Oreos sold worldwide. That cream filling that many find so tasty is because of palm oil. It’s been almost 10 years since Mondelez said they were going to eliminate rainforest destruction from their supply chain and protect our forests and climate by the year 2020. However, the snack food giant has yet to deliver on this promise and continues to buy palm oil from rainforest destroyers despite making these global commitments. Big brands have a decisive role to play to stop deforestation and protect our climate. As long as palm oil continues to be one of the leading drivers of deforestation our campaign continues. 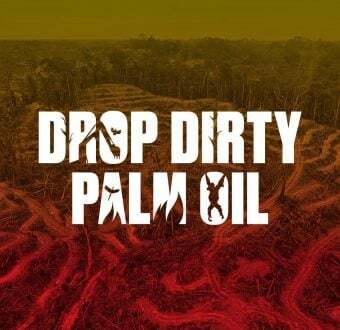 We believe Mondelez has not only the responsibility but a clear opportunity to make a difference to move the biggest and dirtiest palm oil trader, Wilmar International. Mondelez buys much of its palm oil from Wilmar, so it should either get them to change or take their business elsewhere. 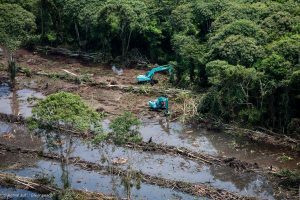 Excavators clear intact peatland forest and build drainage canals in a palm oil concession owned by a subsidiary of Bumitama Agri Ltd, a dirty palm oil producer group that supplies to Wilmar and Mondelez. When you strip rainforests from the planet, we all lose the power that forests have to regulate our climate and we risk driving species to extinction. In a three-year-period alone, Indonesia lost 146 soccer fields of rainforest every hour. That translates to one soccer field of rainforest every 25 seconds. Just this month the UN’s Secretariat of the Convention on Biological Diversity warned that biodiversity loss was ‘a silent killer’ and as serious a threat as climate change. There is no reset button for climate change and time is running out. Should you stop eating Oreos? While we’re not asking you to stop eating the beloved cookie, we are asking you to join us in holding Mondelez accountable to their sustainability commitments. We are not calling for a ban on palm oil or products that contain palm oil — because it is possible for palm oil to be produced responsibly. However, when companies start to clear massive amounts of forests to make way for these plantations, then we all have a problem. 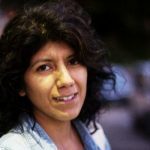 When human rights abuses like displacement, land grabbing, or slave and child labor are associated with the production of palm oil for the products we buy, we are also responsible for exploitation. We all have a right to know where the products we buy come from and how key ingredients are sourced. We have seen activism and the public voice force large companies to be better and achieve real results on the ground — like with the Amazon Soy Moratorium. Join us in our call to action to protect Indonesia’s rainforests by asking Mondelez to cut off Wilmar until it can prove that the palm it uses comes from growers that are not destroying rainforests.